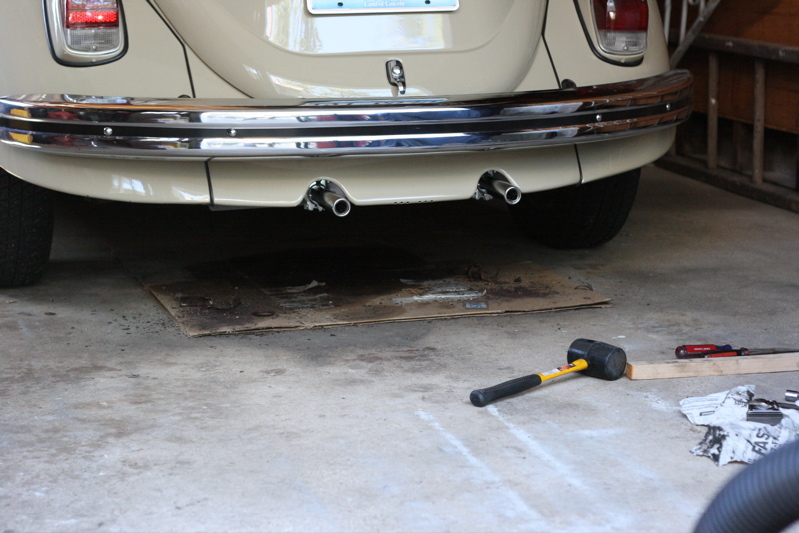 I was performing some tuneup procedures on the Beetle recently and noticed that it was finally time to replace its old rusty muffler: there was a clear exhaust leak in one corner of the nasty thing. John Muir says that the job is much easier to do when the engine is out of the car and my Bentley manual only tells how to do it with the engine out, but I didn't feel up to pulling the engine just to put a new muffler on. So here are pictures showing what I found while following John's procedure. It took a long time, but it wasn't particularly difficult. The muffler is beneath the car, of course, but to get it off requires removing a few pieces of the engine tin. Specifically, we need to get the very back piece of black tinwork off, the one with the air hoses coming through it. Removing it requires removing a couple of other pieces first though. After pulling the left-hand fresh air hose we can see the first piece of tin to pull: the dirt-covered one behind the heat riser tube. This little bit is held on by the three screws seen here and is easy to remove. Here's what you see when that piece has been removed (and after I have adjusted the white balance on my camera). 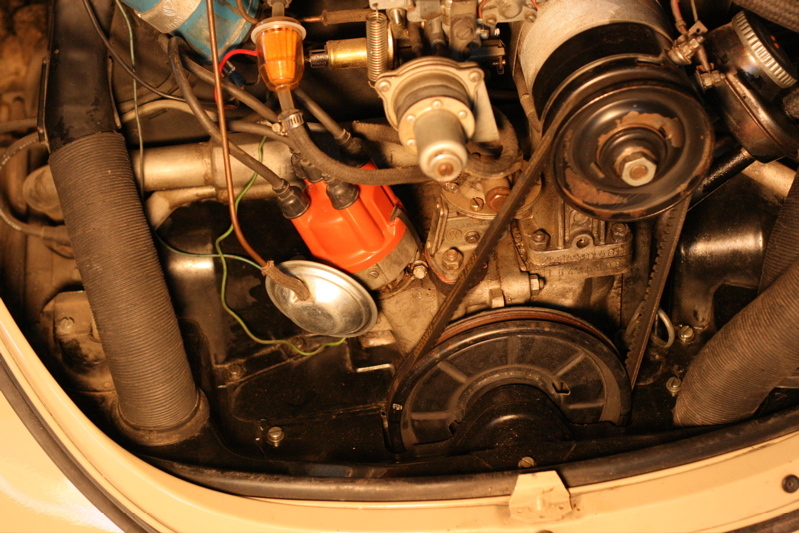 There's a similar piece on the right-hand side of the engine that needs to come out too. 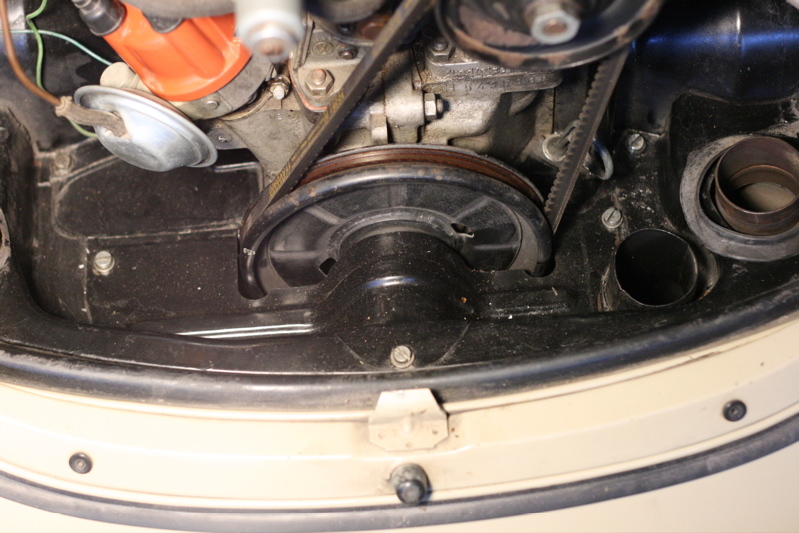 The next order of business is to remove the pulley cover plate seen here. It doesn't actually cover the pulley, but it does hide some of it. This is held on by the three screws seen in the picture. Once that piece is gone we are ready to pull off that rear-most piece of tin. It has a few screws holding it down around its perimiter, but they're easy to find. Once you have these three pieces out I highly recommend giving them a good wash, especially if they are as dirty as mine were. They look a lot better when put back in that way. Tin out! 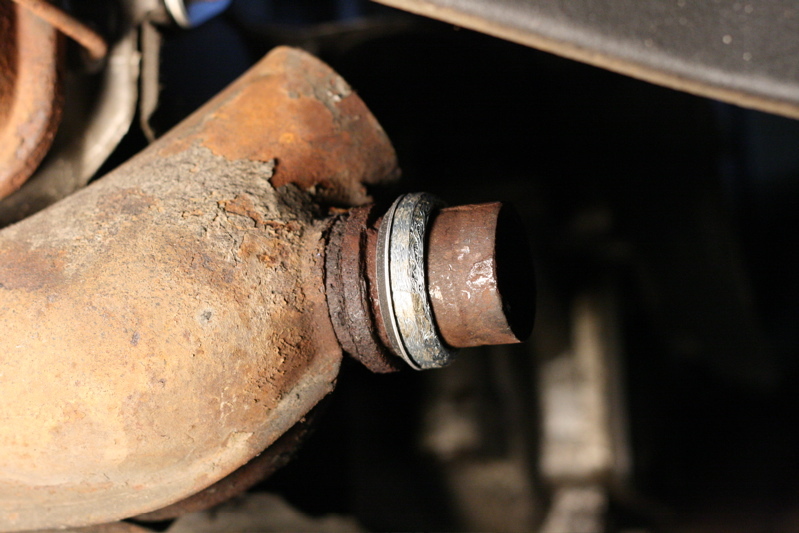 Now we can begin to see actual parts of the muffler (remember that thing we're here to replace?). 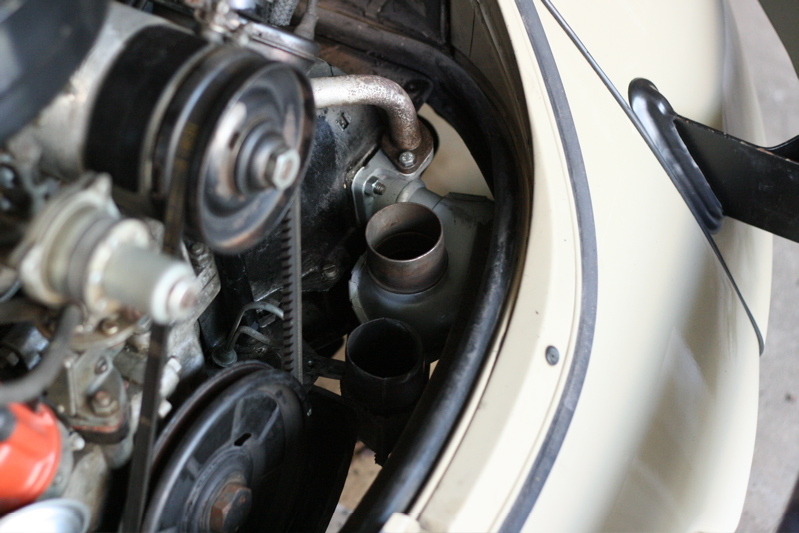 The muffler is held to the heat riser by the two bolts seen here and to the cylinder head by the one nut seen here and a corresponding nut opposite it. John suggested these might be difficult to remove, but mine came right off. Here's what the right-hand side looks like. Note that I spilled oil on this side last time I filled up the engine. Oops. 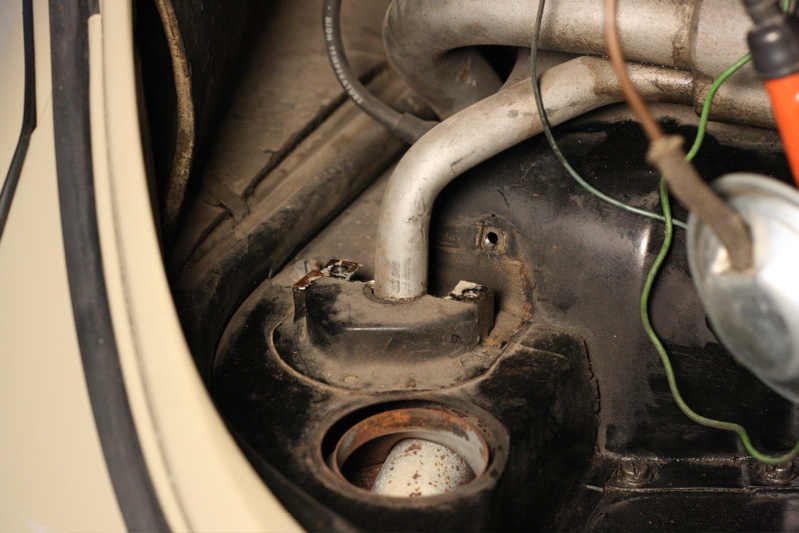 Beneath the engine the muffler attaches to the heater boxes through this little tube. Normally there is a clamp wrapped around the rusty gasket seen here, but I got excited ripping it off and forgot to take pictures. 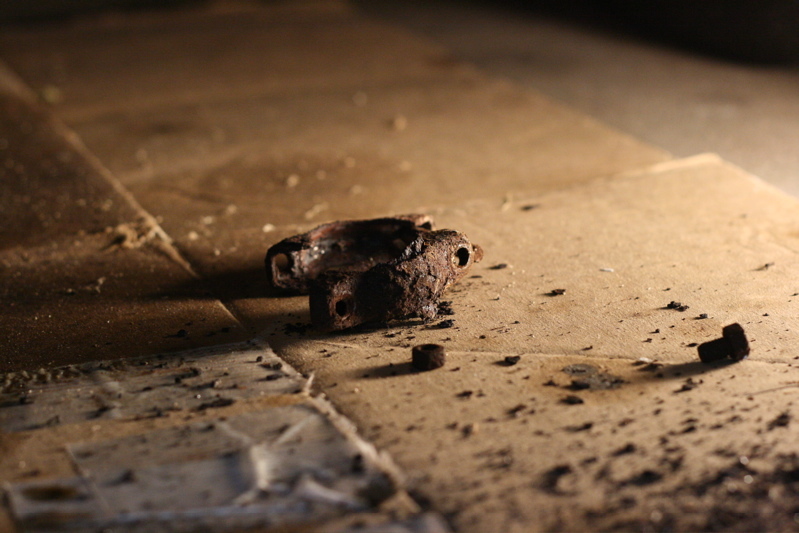 Here's the rusty clamp that I pulled off before taking the above picture. 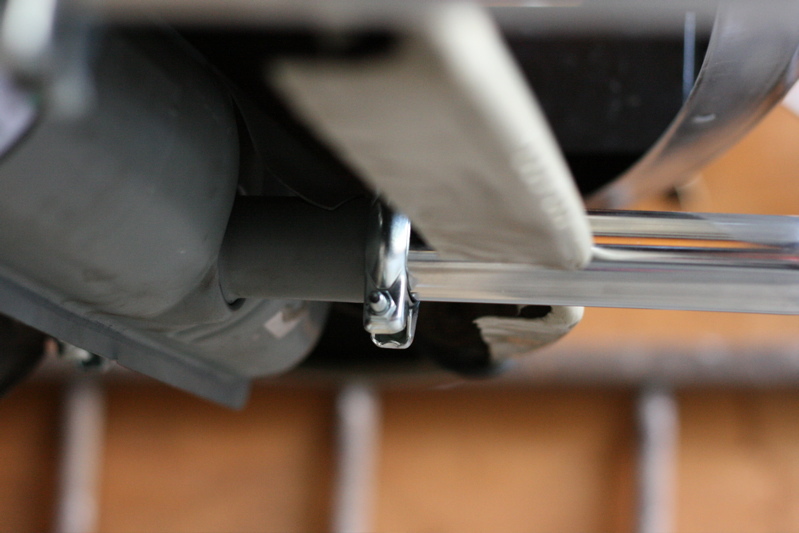 I twisted and broke the bolt on both sides of the car (just like John predicts), so it definitely is a good thing new clamps come in the muffler connection kit. 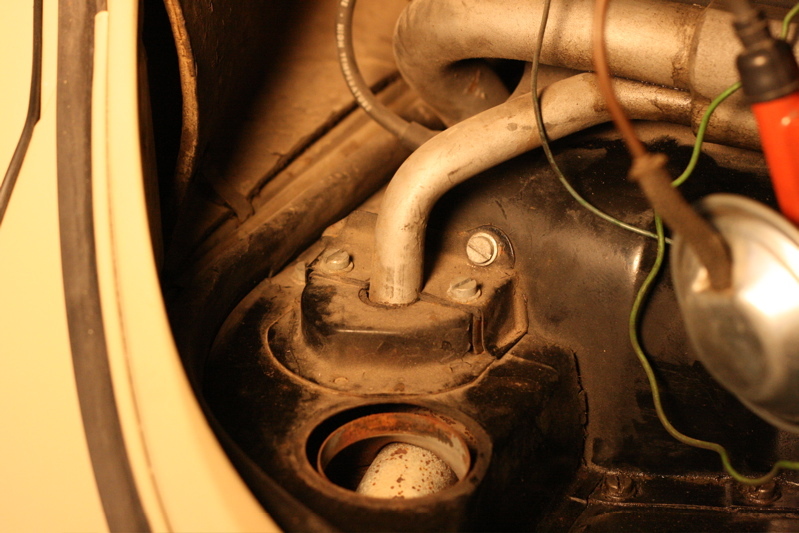 Beyond the years of rust around the muffler-to-heater box junction, the only thing holding the muffler on now is a little screw clamp on each side. I took these off last for some reason, but it turns out I would have had much easier access to one of my earlier nuts had I taken them off earlier. 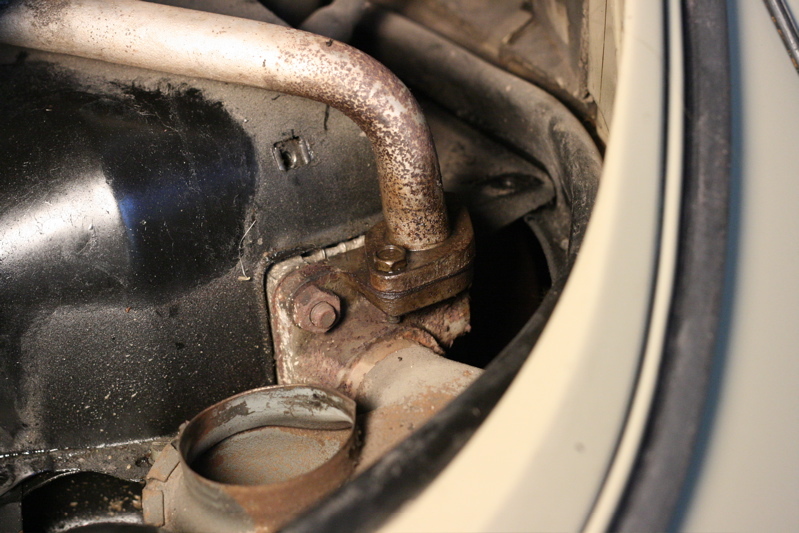 Keep that in mind if you find an annoying screw in the way as you try to loosen the muffler nuts. 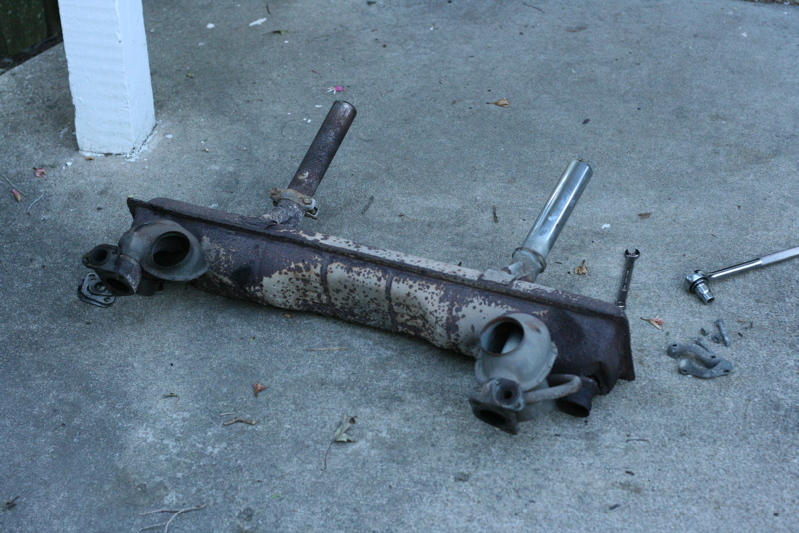 Finally, with a bunch of tugging and hammering, the muffler came off. I flopped it down in the driveway and let it think about what it had done for a while. The new muffler is much prettier, cleaner, and less dented than the old one. I always feel bad putting nice new parts on a car when I know they will eventually look like whatever old one I am replacing. 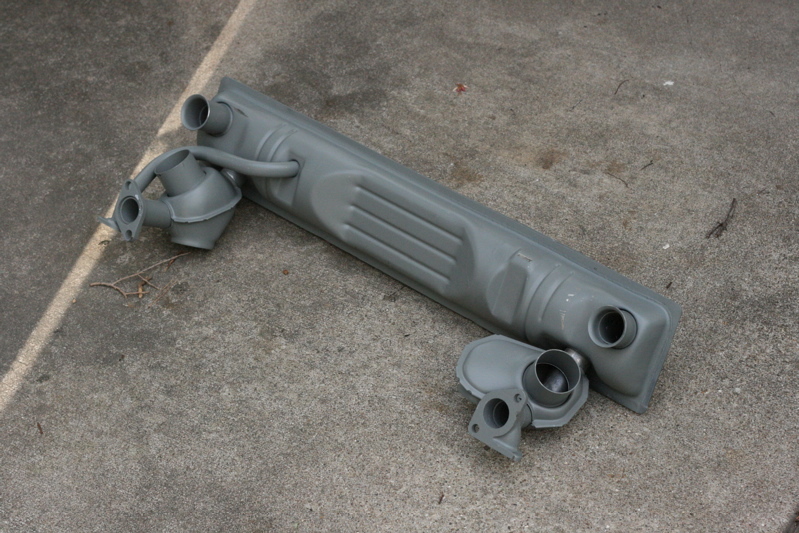 This is the pile of extra parts needed to attach the muffler. 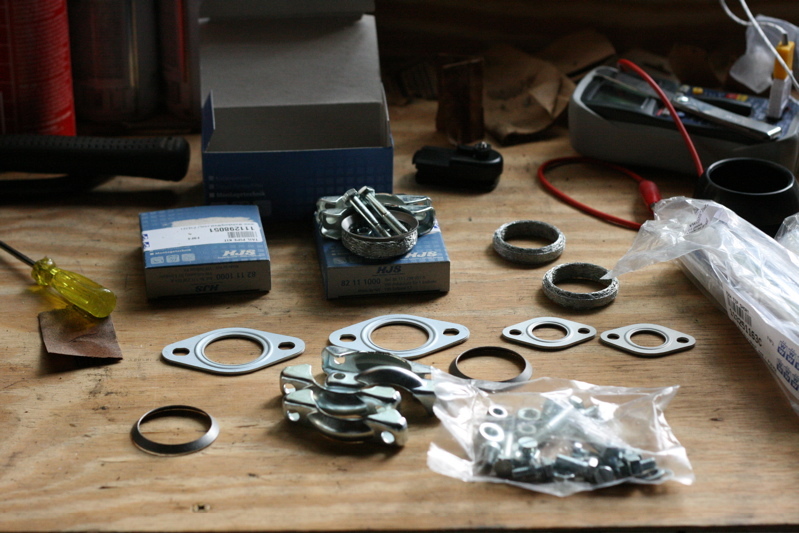 On the workbench are the gaskets, screws, and clamps for attaching the muffler itself, while the two small boxes contain the gaskets and clamps for the chrome tailpipes. 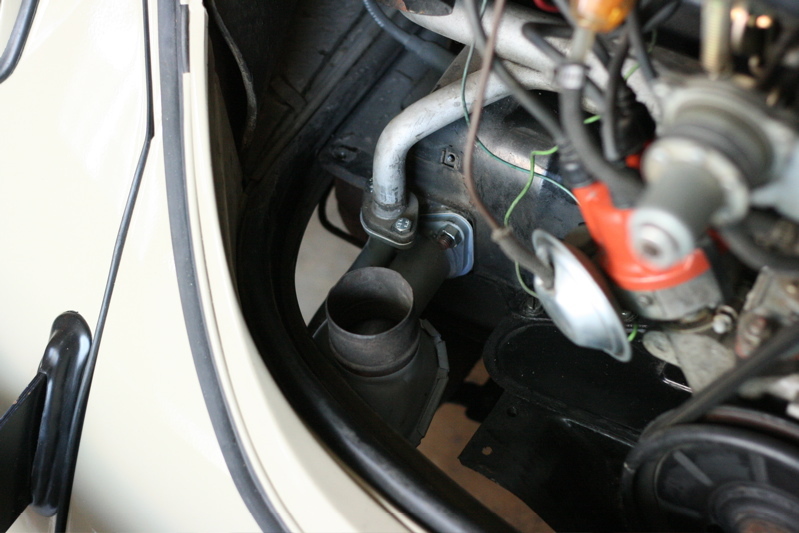 Here we see the left-hand exhaust hole with its gasket in place. The right-hand gasket fits on very similarly. 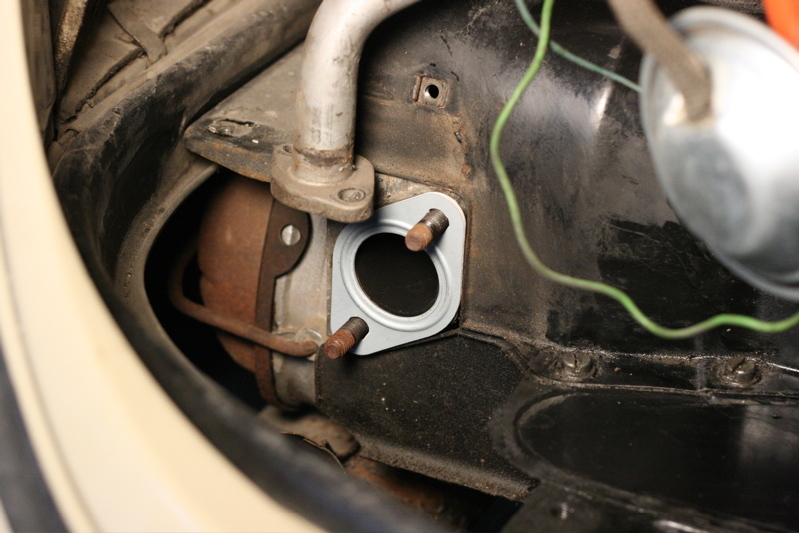 This is a shot of the little metal right and gasket installed on the left-hand heater box. Like above, the right-hand one fit on in a similar way. After lots of pushing, pulling, tugging, and hammering, I finally got the muffler on and bolted down. 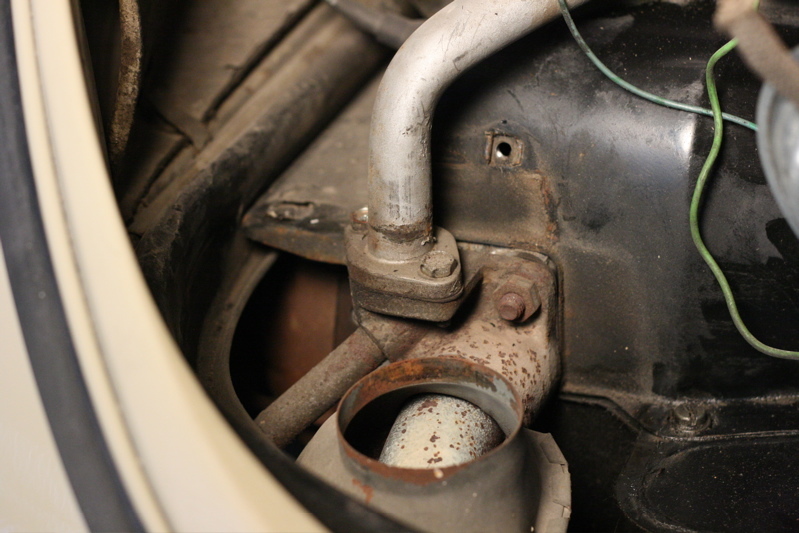 Note that the warm air intake (the black hollow tube below the gray hollow tube toward the center of this picture) attaches to the lower muffler stud, and that its bracket slides on after the muffler. 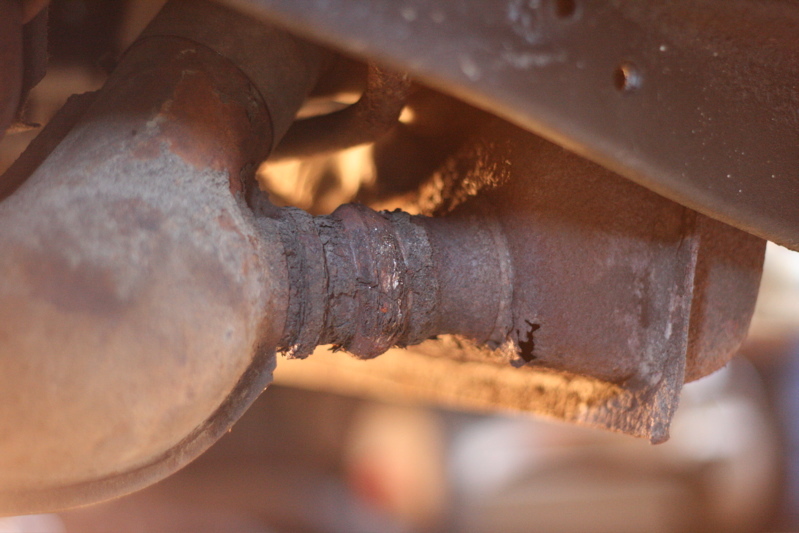 I somehow got it slid on between the muffler and the gasket the first time and didn't get a good seal on that pipe. This is what it looks like on the left side. 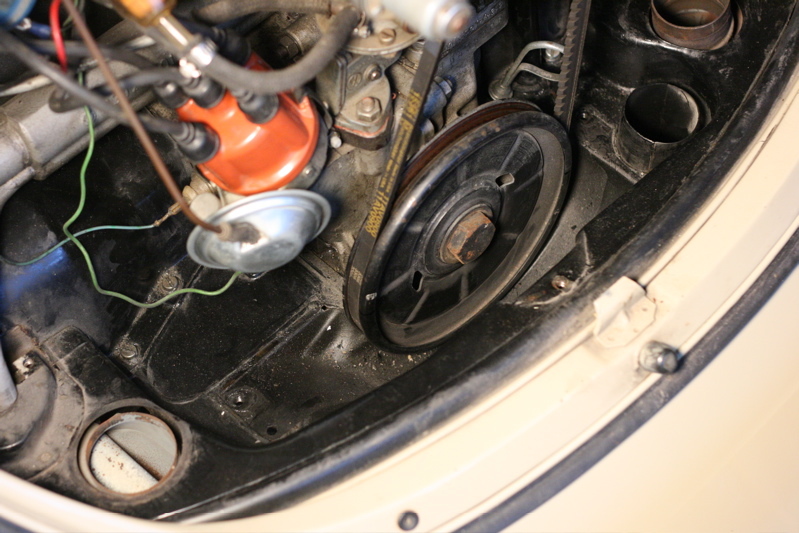 You can just barely see the new gasket in the heat riser junction. I slipped those in place when the photographer wasn't looking. 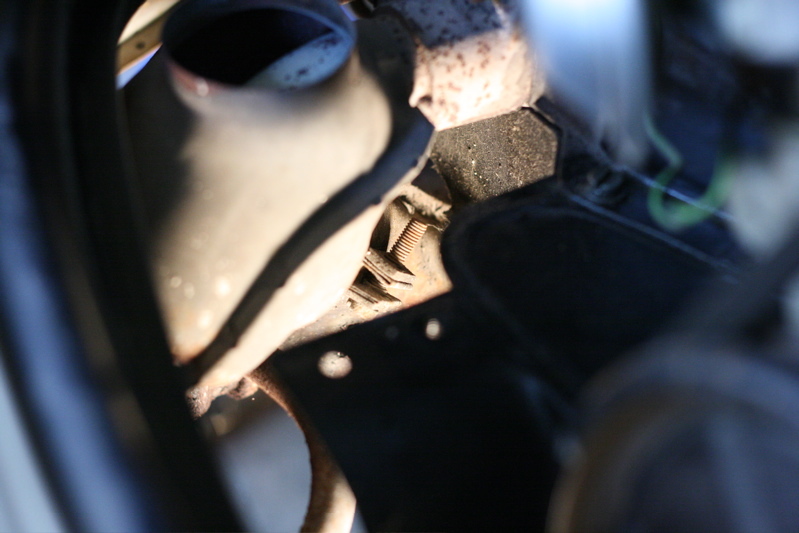 This is what the junction between the muffler and the heater box looks like once the clamp is in place. I was originally planning to put the clamp on horizontally (like the old one was), but a picture in the Bentley manual inspired me to put it on vertically like this. That made it a lot easer to fit a wrench on both sides for tightening. 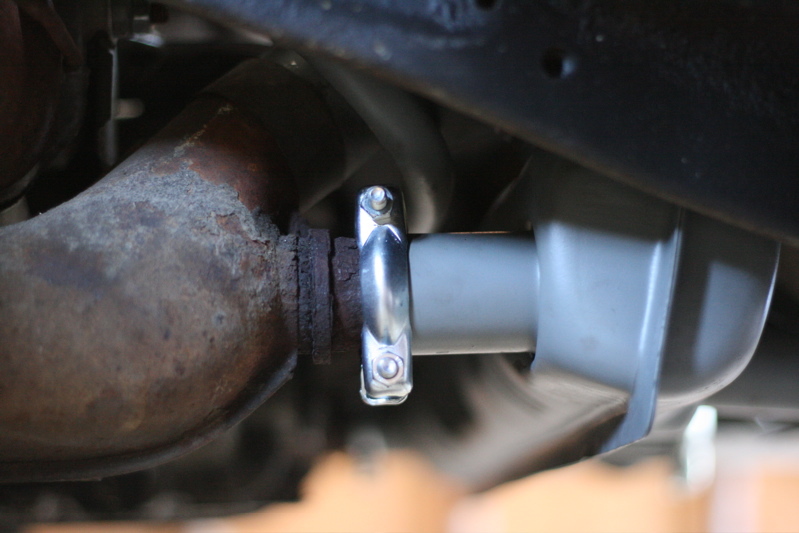 The tailpipe has a similar clamp, of course. This one was especially easier to put in place vertically. Next time I do this I might not follow John's order of events and put the tailpipes on before putting the muffler on the car though. Then it wouldn't matter so much. And the work is done! Everything looks so pretty and shiny now that it is done. The carnage from the previous muffler is still obvious on the oil-soaked cardboard box though. After finishing the job I can see why John suggested that it is easier to do this job when the engine is out of the car, but it really wasn't too bad to do in place. I just wouldn't plan on getting it all done in one short fall evening.